In the northeast corner of the property is a small circular garden that Farrand designed to be surrounded by lilacs and filled with Lily of the valley and daylilies. When the lilacs began to fail in the 1950s, landscape architect Alden Hopkins replaced them with camellias and the name of the garden became Camellia Circle. But in the 1990s when the camellias failed to thrive, the gardeners chose a Korean lilac, ‘Miss Kim’, which is more tolerant of the circle’s growing conditions, and the garden is now planted with a mix of lilacs, spring bulbs, annuals, and perennials. 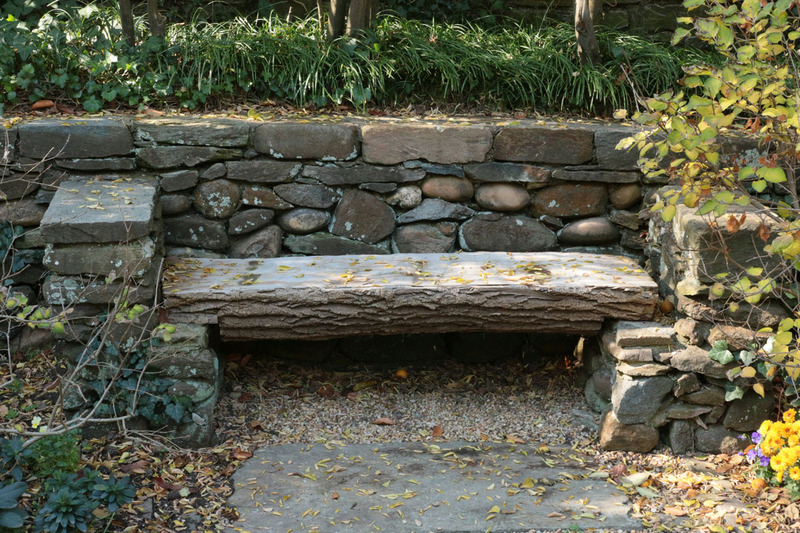 Rustic bench, oak and fieldstone, Beatrix Farrand, ca. 1935–38.